This is one of my wife’s beloved family recipes. 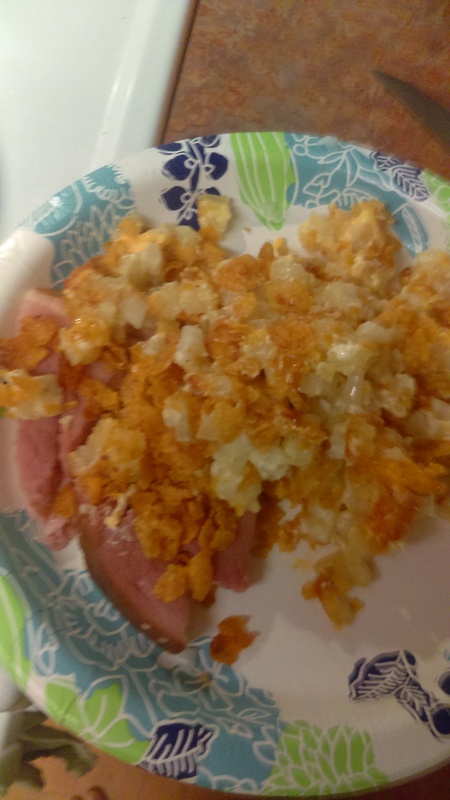 Mix all ingredients together, put in greased 9 x 13 pan, sprinkle 1/4 cup melted butter, then mix with 2 cups crushed corn flakes. I’m pretty sure this was the first dinner I made, years ago. My wife really wanted to eat it, but didn’t want to make it, herself. I knew the recipe was essentially, put everything in one big bowl and mix it and bake it. Like most recipes, if it calls for any amount of onion, I just use the entire onion. One, we’ll never use the other half of the onion in a timely manner; and two, we like onions. Velveeta doesn’t make a 10 ounce package, so we go with the 16 ounce package. I’ve trade eight but it never seems like enough cheese. My wife enjoys making dips and such, with the other six ounces. The amount of Corn Flakes, is also up to you. Two cups doesn’t seem enough, five is too much, but not really. Crushing the Corn Flakes is pretty relaxing until one of the sharper edges pokes you. We usually eat it with a ham steak, I believe I went with the Hatfield brand. I never know what to cook or glaze it with, so I use butter. Delicious butter. Didn’t make much progress in any of my shows this past week. Walker Dennis has been waiting up for me to come home from my part time job, so I’ve been missing my three hours a week of watching shows. Which is nice, as that means I’m sleeping by 11:30pm or midnight instead of 1am. I have a really hard time falling asleep, on my own. So no new Doctor Who but I did finished the second episode of Crazy Ex-Girlfriend. That show has amazing songs, so I thought my son would be okay with that. I did end up watching Trolls three times and parts of Sing, twice. Oh! We finally watched Rogue One! Pretty good movie. That ending though, I love how it connects with A New Hope. Thanks to YouTuber Edward Glover for hosting the video. I imagine he edited it. I enjoy Star Wars, I’m not like a super fan or anything wherein I can name you every planet that they visit, but I enjoy the films a bunch. I’m more than a casual fan but I’m not running around having deep conversations about the Force or anything like that. Though I wouldn’t mind being in a Star Wars conversation, it just rarely happens around me. It bugged me that we were getting Black and then, Yellow Storm Troopers. Where was those guys 20 years earlier or even months later? I get that the Black Storm Troopers were that guy’s own military force (I imagine) and maybe the Yellow Storm Troopers were that moon’s version but they inclusion took me out of the film. I apparently liked the film enough to rank it at #1038 over at FlickChart. Right between Dorm Daze and Where The Heart Is. I liked Diego Luna in it too. Apparently, I’ve seen him in The Terminal and Milk, but don’t recall him. Hey, he’s in the Flatliners sequel, so I’ll see him in something else, relatively soon. Our next episode of The Office is Season Three’s The Convention. I’m trying to reestablish my link with Tumblr, for this post, but it doesn’t seem to be working. I’ll try again on Wednesday.